In improv, with just a prompt, the actors on stage create an entire scene out of thin air. To the audience, this looks like magic. … But to the person who has adopted a “yes, and…” mindset, improv can serve as a guide to improve corporate culture and performance. 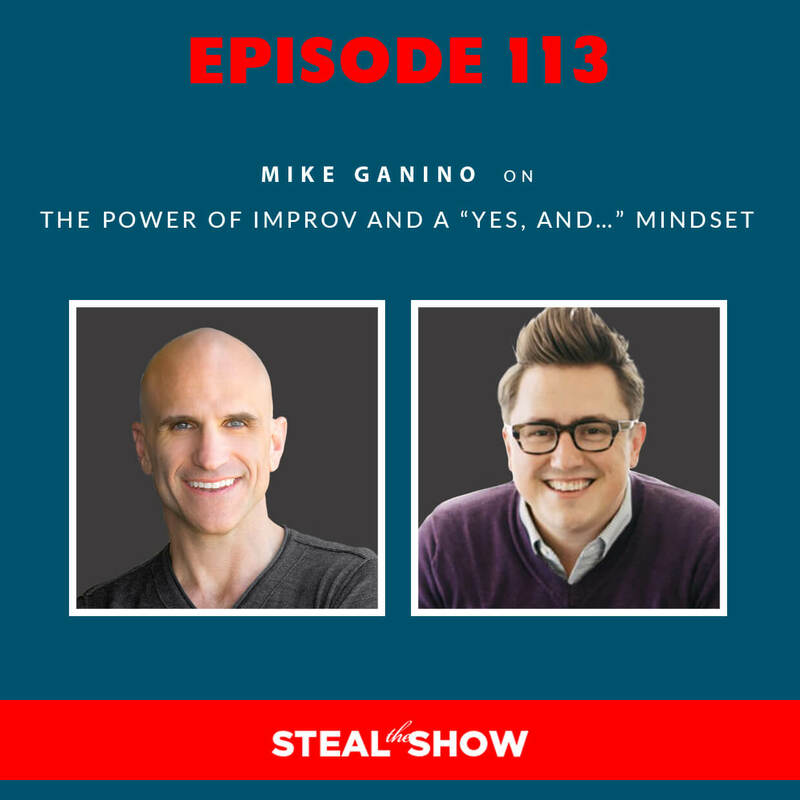 On today’s episode of Steal the Show, we are joined by Mike Ganino to discuss what happens when we take the principles of improvisation into our real life. Mike is a culture and storytelling expert who helps executives, teams, and thought leaders to better communicate, connect, and engage. And, Mike also happens to be the Senior Performance Faculty member for Heroic Public Speaking Graduate School. Named a Top 30 culture speaker by Global Guru, Mike is the author of Company Culture For Dummies. Tune in to hear Mike’s insights, and how they help business and brands move towards both a better customer and employee experience. The rigid day-to-day motions of the office constrain our being. Adopt a ‘yes, and…’ mentality to accept the input of other people and explore unintended consequences. The world is VUCA – Volatile, Uncertain, Complex, and Ambiguous. Meetings should end with the leaders exhausted, and the team members excited. Bring bricks to the conversation by making statements instead of asking questions. In performance reviews, leverage what’s working instead of critiquing what isn’t. The core of company culture boils down to relationships and communication. 00:00 Mike Ganino: What if there was a fire in the kitchen, and the person couldn’t find the fire extinguisher? Would I not want them to come and tell me, “Oh my gosh, there’s a fire! I don’t know what to do?” Or would I say, “Well, you don’t have a solution, so let’s let the whole place burn down. 00:17 Michael Port: Welcome to Steal The Show, with Michael Port. Today’s guest is Mike Ganino, and he’s the head performance coach at Heroic Public Speaking worldwide. He is also a culture and storytelling expert, who helps executives, teams, and thought leaders communicate, connect, and engage. He’s the author of Company Culture For Dummies, and has been named a Top 30 Culture Speaker, by Global Guru. Organisations love Mike’s high energy. I love Mike’s high energy. His high engaging workshops and keynotes fire people up, and it helps him rewrite the stories happening in their culture. They leave with real life strategies that they can begin implementing immediately for improved culture, that drives employee and customer experience. Mike’s work with Protein Bar, ChowNow, Lettuce Entertain You – great name! – A Potbelly Sandwich Shop, Snagajob, National Association of Catering and Event Planners, and the American Marketing Association. So, without further ado, here’s Mike. 01:23 Michael Port: Howdy! So, this is a question that I know that I know the answer to, because I’ve seen the impact it has on all of our students, but from an outsider perspective, improv might just seem like a day of fun. And you’re trained through Second City, which is a very, very famous comedy improv troupe. So, how does improv relate to the corporate culture, and how does improv go past just a day of play? 01:53 Mike Ganino: So, it’s such a common misconception that improve is all about playing, and it can look like it on the outside, because people are running around, they’re having fun and they’re exploring different ways of being, but what’s interesting is, if you think about play, and if you think about why we used play, as children, we were learning ways of being. So when we’re little, we play house, we play business. I used to love playing teacher and librarian, I don’t know what it was. I would take all my library books and my aunt was one of the very early people involved in computer science, and so, she would have a little scanner, she made a scanner for me, and I would play library. So, as children, we’re obsessed with playing as a way of being an adult, and we’re learning how to interact. You see it in animals. Dogs are known for doing bite inhibition. So, they’ll bite each other when they’re puppies, puppies are always biting. It’s not because they’re trying to hurt anything, it’s because they’re learning, what is a playful bite, what is a big bite? And so, the same thing happens, that we have to kind of play, in order to find new ways of being. And so, what happens at work is, we tend to operate on default. We go to meetings and we act the same way. We go to performance reviews and we have this system that we’ve always done, and we’re so scared of being another way. And what improv does is, it allows people to explore other ways of being. And, because of the trust we build in that space, it allows them to do it in a way that gives them a chance to say, “There’s another side of me.” And so what happens after we do that, is we see trust go up. We see risk taking go up. And so, improv gives them space to find other ways of being. And when people find those other ways of being, at work, then there’s all kinds of things that can happen, from different relationships, to actually throwing your ideas on the table so that we can explore it, and that’s one of the things that I see happening so often, is that people are scared to contribute, they’re scared to speak up. And so, the best ideas, the best things never surface, because nobody raised their hands and said it. And I’ve been reading a lot of ‘exit interviews’. There’s this thing that they do in companies called exit interviews. When people leave, they ask them, “What could we have done to keep you?” and, “Why did you want to leave?” and stuff like that. And, what I see all the time is people saying, “Well, I had all these ideas, and no one listened.” Or, “I had all these ideas, but I didn’t think it was needed.” And, what I know improve does is, it gives them room to contribute in a big way. I mean, I encourage them to, but it’s not something they’re naturally inclined to do, certainly [not] in front of everybody else. So, I will often tell myself to stop talking. And that’s an improv. I have to be able to change my natural way of being, and that’s improv. So, what we know is, most of the most successful people are often very adaptable, they’re flexible, they don’t have a rigidly fixed way of seeing themselves, and their identity is not so wrapped up in a little box, that isn’t expandable that they don’t grow, they don’t know how to grow. So, it’s not just doing more, I think, it’s whatever is necessary for each one of us. How do we play with different ways of being so that we can be more effective? Do you have an example of maybe one of our grad students, or maybe a company that you’ve worked with that was sceptical that improv would be helpful? And, if so, what are some examples and what kind of real change did you see, both in individuals and/or companies using improv. 06:15 Mike Ganino: So, two examples there. One is on our grad students’ side. A lot of times they’re not reluctant to use it, because I think the great thing is that when students come to us they’re so often, they come in with a high level of trust, and they really believe in the work we’re doing. So they’re coming in and they’re trusting us. What I think is interesting is that, what I’ve heard from so many of them is that they’re going to get on stage and they’re going to perform and they’re going to get master coaching, they’re going to get vocal [coaching], but what scares them a lot is the improv side of it. They’re frightened of the improv, and I always think, “You can’t make stuff up wrong. What are you scared of? You’re going at impulse and you’re making stuff up, so what is so scary?” And what I learned, what I think is true in our grad students, and in my corporate clients, too, is that it is being scared of being someone new in front of people. I think when it comes to the improv side, they think, “Oh, I’m supposed to be funny, and I’m supposed to create something and I’ve got to do something on the fly.” And so, what I find is that they’re so scared of it. 07:29 Michael Port: As if improv is only meant to be entertaining. The way we use improv, the way I’ve seen you use improv, is not always to entertain, but to produce results. And sometimes entertaining people is not an objective that you have. If we spend most of our time trying to entertain people, we don’t actually achieve anything. And I think that’s really interesting. But, you know, one of the things that you mentioned in Company Culture For Dummies, is that the military uses improvisation techniques. Now, to some, that may be surprising, because the military is known for being so regimented and structured, so can you speak more about that, and how they use it? 08:18 Mike Ganino: Yeah, so there’s this thing called, VUCA. So, in the book I talk about VUCA, it’s an acronym, V.U.C.A. And it basically means, the world that, often, the military is going into, it’s a military term, but I apply it to business and all kinds of other places. And so, the idea is that the world is Volatile, Uncertain, Complex and Ambiguous, meaning, we’re going out there with a new product, with a new idea, with a new speech, and we don’t know what’s going on in the space. The world is shifting and it’s happening all the time. The same as with the military, they can plan and prep as much as they want, but when they show up on the field, when they show up to do the work, they don’t actually know exactly what’s going to happen. They have to use the emerging information, the emerging happenings, to decide how to respond next. And so, the training, you have to train, I think you’ve said it before, you have to train to a certain level so that when the time comes, you can perform at a certain level. And so, with the military, they train at a certain level. They do all the perfect practices, they know exactly how everything should happen in a perfect world. Unfortunately, that is not the world that they walk into. And that same thing happens whether we’re talking about boardrooms, whether we’re talking about product launches, whether we’re talking about a speech. You don’t know, when you get on stage, exactly what’s going to happen, no matter how much preparation you give it. And that doesn’t excuse preparation, you need to prepare so you can be in the moment. And so, the military operates under that VUCA, Volatile, Uncertain, Complex, and Ambiguous. Which is really, if you think about it, that’s the current market. We don’t know what’s going to happen next. We’re dealing with ambiguous terms, ambiguous clients. The world is shrinking, and all these things that we’ve been saying. I think people have always said that, right? 10:01 Mike Ganino: I know! 10:02 Michael Port: And really, we always say that. We’ve been saying that for, you know, a couple of hundred years, and we’ll say that in another couple of years, but it’s actually just a normal way of being that things change. I mean, it is really interesting, and I’m not a philosopher, but I imagine one could have very, very long conversations into the night over a nice glass of Pino, but the question is, why are we so interested in trying to keep everything the same, and getting frustrated when it doesn’t always go our way and stay the same way that we want it to be, just the way it used to be, et cetera, when, in fact, we live in a constantly changing environment, and, as people, we’re constantly changing? 10:43 Mike Ganino: And wouldn’t it be beneficial to learn a framework in which you could respond to change? 10:49 Michael Port: Can you articulate a framework? Because, you know, if you haven’t done this kind of work, it’s a little amorphous. Okay, I understand, I’ve got to be improvisational, and I’m improvisational, because things happen and I just respond differently. So, what do I need to do, what value is in there, in having a framework? What is that framework? How is it implemented, et cetera? 11:13 Mike Ganino: Yeah, I mean, the core of improvisation, no matter what school you go to or who you learn from, the core of improvisation is saying ‘yes, and’, which we know, because it’s in our pledge that we do with our students, and it’s a way of being, I think, for us at Heroic Public Speaking. But, in organisations, the default answer is often ‘no’, and you know what? Honestly? The default answer in so many of our lives, is ‘no’. The default answer is, ‘what happened before?’ and so, I think, what if your default response was ‘yes’, and what if, then, after ‘yes’, you had to say ‘and’? And so, the opposite of that, of course, is ‘no’, which often we don’t do when we’re in a meeting, so you’re listening to this and you’re about to head into a meeting, you’re in the car, approach it differently this time and instead of your automatic response being, “Well, we couldn’t do that,” or, “That wouldn’t be possible,” what if you said, “Yes, and,” then you added an idea to it. So, in an improve scene, when were doing it in theatre, if you said, “Hey, I can’t believe how small the world looks from way up here,” and I said, “Well, what do you mean? We’re only on the second floor,” now everyone is seeing it. Now you and I don’t know where to go next, the audience has no idea what’s going on, and we don’t have good theatre. And then say, “Well, what can I do with that?” Which is the ‘and’ part. And so, the simplest thing is, go to your next meeting and do that. Sit in the next meeting and instead of saying ‘no’, or the slightly less rude, maybe in the US, we like to be nice a lot in meetings, is the ‘yes, but’. “Oh, yes, that’s a great idea, Michael, but that will never work,” because that’s just a passive-aggressive ‘no’. But, it’s acknowledging the input from the other person as valuable, and worth considering and the ‘and’ allows you to explore unintended consequences or other aspects of the situation that maybe the person hadn’t considered, but they don’t feel shut down in the same way. And it’s the same thing with Q&A, because, often, people will ask questions that we feel we might really want to say, “What? Why did you ask that? That was really…” you know? But, of course, we’re never going to say that, but, I mean, we don’t really think that, but, you know, we don’t always get the questions that we want, and people might say things that we disagree with, and if we act defensive and when we say, “No,” quite quickly, that is often read as defensive. But if we say, “Yes,” we are recognising and honouring that there are other ways to contribute, that there are other processes, there are other systems or protocols, or other ways of seeing the world, and then we can expand upon it from there and everybody feels included. I remember I saw a video of a very, very well known speaker, and it was a huge event and he had lines of people on the sides, lining up waiting to ask questions at the microphone. And someone asked a question, and he said, “Hmm, that’s a stupid question.” Ah! Oh! Now, I understood why he said that, and it may have been on brand for him, but the consequences were very clear. I saw people who were lined up at those microphones, turn around and just sneak back to their seats, because they did not want to be put in that position where they were told that their question was stupid or that they were stupid, in front of three thousand people. 15:30 Mike Ganino: Yeah. And so, think about it this way: Two things that made me think of – one, that is happening every day, at work, for people, every day in meetings, every day in brainstorming sessions, that exact thing is happening. So, on a much smaller level, someone in the room, and it doesn’t always have to be the manager or leader – so if you’re listening and you’re the leader, and you say, “I always say ‘yes,and’ to my people’s idea,” – if anyone else in the room who’s perceived to have a certain level of status, is a ‘no, but’, or a ‘yes, but’ person, then you’ve done the same thing that that speaker did to everyone else, which is, once the first person gets a ‘yes, but’ or a ‘no’, guess what everyone else does? They take brilliant ideas, those ideas that probably could be ‘yes, and’ed into something marketable and useful in the market place, they put them right back in their pocket and you never get to see the greatness. And so, that exact same thing happens on a small scale every single day in our lives. And, what I think is interesting and I teach our Q&A sessions because we teach this at our grad program at Heroic Public Speaking, and I teach the Q&A, and one of the things I say is, “What you’re often doing is you’re ‘yes, and’ing the situation. So, you don’t necessarily have to ‘yes, and’ the person’s question, you’re ‘yes, and’ing the fact that the question has now been asked in the room. So, how do you agree that this question has been delivered, and now let me heighten this and create an experience for the audience with it. And that could have happened for the speaker that you’re talking about, to say, sure, maybe it is a silly question, but there’s a way to have created an experience for the whole audience there, instead of tossing it. And the same thing happens on panels, right? Like, in our grad program, we also do a session around panels. We talk about media, so if you’re on podcasts or on TV, how do you ‘yes, and’ that moment? And when I work with executives and leaders on media presence, or podcasts, it’s the same thing. And so, this ‘yes, and’ idea can be used in so many places. 17:25 Michael Port: Yes! And, let’s go deeper on meetings, because, one of the things you mentioned in the book is that leaders of the meeting should leave exhausted from the meetings and the team members should be excited, rather than the other way around. So, why is that? I mean, I don’t want to leave tired every time I have a meeting, but I do want my team members to be excited. So, could you unpack this for us? 17:50 Mike Ganino: Yeah, so any meetings – and I feel the same about one-on-ones, so whether we’re talking about group meetings, or talking about one-on-ones, you can take this note and run with it – the idea is that if the meeting is for the leader every time, if the meeting is that leader can receive status updates and project updates, then that probably could have been handled via an e-mail, or via some other form of update. We spend a lot of time in useless meetings, and we’re often draining employees in them. And I’ve seen over and over where someone who’s a manager or a leader who will have a group of folks who report to them, they’ll meet every week, and then it’s each individual reporting to that person what’s going on. And I teach this – I don’t even know where I learned it, so I hate talking about it, it is not my original idea, I don’t know where I learned it, it’s just been in my brain for a long time – this LTO method. So, you’re walking by someone’s desk or your updating with them – even if you’re a coach, if you’re listening to this, and you’re a coach of some sort, this is a great thing, LTO – what did you do last week, last day, since the last time I talked to you? What’s on your agenda this day or this week or this month? And what obstacle do you see getting in your way? What if you created meetings that the team left and said, “Ooh! I am energised!” And the reason that might be exhausting for some folks as the manager or leader of the meeting is that it takes a lot of work to run that meeting. It takes a lot of work to be that present, and that engaged, so that the team can get what they need from it. And so, I don’t think you need to be exhausted necessarily from, like, “Oh, I’m drained! That was so hard!” But it should definitely be, like, “I didn’t just show up in a seat and sit there and wait for my team to report in, I showed up and I was present and I was engaged, and I was getting what we, as a collective group, needed. See, I actually thing that those meetings should be the same as the frameworks that we teach at Heroic Public Speaking, around what’s the audience going through, what are they thinking about, what matters to them, what do they want? I think, as a manager, you should be thinking about that before you go into meetings as well. It’s another form of presentation. 20:23 Michael Port: Well, we actually recently changed our meetings. Now , you’re not in the office with us every day, so I don’t think you’ve seen this change, but we were having seriously long and, often, boring meetings, which I just thought, “That seems really incongruent with who we are, and how we see the world,” and it just didn’t make sense. Ad so I said, “Alright, we’re not having any more standing meetings. Weekly meetings are done!” Because everybody’s there, even if they’re not always relevant to everybody, so you sit around paying half of your attention to the issue, because it’s not really your issue, and then you’re not contributing, because you don’t feel like you’re adding value, et cetera, et cetera. And so, now we do daily huddles for seven minutes, same time every day. We start at 11:58 every day, or, excuse me, 10:58 every day, and it’s seven minutes and we know exactly what the framework is and they’re high energy, and there’s a theatricality to them, but they’re still very practical, because of the way that they’re done. And then, when we meet, we actually don’t do “meetings” any more, we do brain-storming sessions, but the people who are there are all part of that brain-storming session. Or we’ll do leadership development sessions, where a leader on the team may be teaching something to the people on the team, about a particular methodology or way of working that’s not just related to work that’s being done right now, but is something educational so that everybody’s education continues to grow. But we’ve moved away from that meeting as you just described it, in part because of what you just said, you know? Like, I would show up to the meeting and I would say, “Okay, let me look at the agenda that Kate made,” and everybody had put their items on the agenda, and you just go down that long agenda, going through all these items that each person put on and it’s just a complete waste of time. So, my point is, even in an organisation that understands how to influence people and how to create exciting opportunities, and we’ve created, I believe, an extraordinary culture, for our students and for our staff, there were still elements of our culture that were antithetical to the kind of culture we want to create and you’re just trying to fix it, one issue at a time. I remember one of the things that I first said to Amy when she came into the business and started working with me, is that our job is just solving problems every day. That’s what we do. Now, hopefully we’re not solving problems that other people can and should be solving, but that’s first and foremost, because, if you, as a business owner are solving everybody else’s problems, why even have a staff? It wouldn’t make sense. But, you’re often helping them solve their own problems, and if the problems you’re solving are growth opportunities, then the company grows. If you’re solving the same problem over and over again, then something’s broken, but if you have continuously interesting and new challenging problems to solve, well then you’re probably going to grow and build. And that’s a part of improv. That’s every day, “Okay, here comes another one, here comes another one, here comes another one. Here comes another one. Oh! Boom! Just got punched in the face with another one!” They just keep coming! So improv is what helps us move through all of those different situations. And what happens is, sometimes, we think because people aren’t quitting the organisation and saying, “I’m leaving because the meetings are horrible!” – I haven’t run into anybody who says that – we think there’s not a problem with it. And that is where, when we think about if ‘yes, and’ feels too fluffy for people, that’s my direct through-line, it’s like, “Well, let’s talk about the results you’re stuck with,” and I can always find a culture and an improv angle to solving real life business problems. 24:59 Michael Port: Interesting. One of the things you talk about in the book is focussing on statements instead of questions, which seems very counter intuitive to what we’re used to, so what do you mean by that? Usually when we’re in meetings or conversations with people, we are told to ask a lot of questions to be interested, curious, to understand them, uncover their issues and the outcomes they desire and the impact that they want to have, et cetera. But you say, “Focus on statements instead of questions.” What do you mean by that? 25:31 Mike Ganino: So, what’s really funny is, I’ve gotten several text messages from clients, from friends, from old co-workers and in general it’s like, “Oh, my gosh, I love this book! It’s like you’re really there! I can hear your voice. You know, there’s one part that I disagree with you on…” It’s always this part, because, somewhere along the way, somebody did come and say that. And, if you read the chapter on effective one-on-ones as a manager, you’ll see that I actually included a list of over a hundred questions you should be asking. So, I don’t know that I don’t believe in questions. What I think is, when you’re in brainstorming mode, when you’re in ‘let’s create something together’ mode, when you’re both trying to show up to move things forward, it’s often not helpful to mention questions. We don’t even need to share it, we don’t need to be 50/50. You be 100% responsible for what you show up and contribute, and I will be 100% responsible for what I show up and contribute. And so, in a brainstorming session, in a ‘let’s solve this customer problem’ session, if we can start getting a ‘yes, and’ feeling going on, then what we know is, I’m going to throw a thing on the table and you’re going to agree to it and make it better. So, if I can put my statements down and I know that you’ve got my back and you’re going to say, “Yup, I see what you put there. What about this? Let’s add this to it. I think this could be cool.” Now we’re making statements, and whether in a brainstorming session, in a customer solving session, I mean, think about the Apollo 13 in that movie. What a great improvisational thing, right? They had to figure out how to get a whole group of people back down here, based on what was in the ship, or in the space shuttle. They put it on the table, and they all started working, they didn’t ask questions, they didn’t question each other. “Well, do you know that the straw won’t break? Do you know this? How do you feel about that?” No, they made statements and they contributed, and I think more of our communications would be better if we each took responsibility for contributing ideas to it. 27:47 Michael Port: That’s just interesting! It seems like it really needs that ‘yes, and’ component to work, otherwise it could become a battle of I-statements. I resonate with that on one level, because it seems like it may empower people to take more ownership of their ideas. Because, often, what I hear from the less senior team members, and new team members is, “I don’t know if this is really super relevant, or helpful, it’s just an idea, so you can tell me to just stop before I go too far, but I was just wondering, could we possibly…?” Boom! And so what happens is, of course, they’re discounting their input, their contribution right from the get-go. And I wonder if they forgot about and let go of all of that apologetic language and just said what they thought, they might actually feel more empowered, more confident, and be more likely to contribute. No, we’re each responsible for bringing a brick, so that we can build something together. And what I find is that what you just said, happens so often. People are very aware of status. We are super, super tuned in to status. We have this activity that we do. We’ll get into a room, a deck of cards, and they’ll tape a card to their head and they won’t know what card they have. So, say that you have the king card, and I have a ten. I don’t know that I have a ten, and you don’t know that you have a king, but we have to walk to each other and treat each other, like, I would see the king on your forehead, and treat you like a king. You would say, “Well, a ten, that’s pretty high status, okay, I’ll treat you well,” versus someone who is a two. That’s going on every day in meetings and conversations. We’re very aware of status and when someone who perceives that someone in the room has a higher status, asks a question like that, it can sometimes receive a ‘no’ or a ‘yes, but’, which we know eventually leads to the kind of latency between people delivering cool ideas. And so, instead, what if we each became responsible for putting ideas on the table, and we trusted the other people in the room to say ‘yes’ to them and help make them better? I think there’s something cool there. You know, the other thing in the book, on the same topic, speaking of questions that has been unpopular, but I stand behind it, you know that saying where a manager, or a leader, says, “Don’t bring me problems, bring me solutions,” you’ve heard this before? 30:53 Michael Port: Yeah, sure! Yeah. 30:54 Mike Ganino: I think it’s so problematic, because what if someone on the team, Michael, found out that someone else was embezzling, but they didn’t know who how to solve it? Would you not want them to tell you? 31:04 Michael Port: Uh, I would want them to tell me! 31:05 Mike Ganino: What if there was a fire in the back, and I use this example because I come from the hospitality industry, what if there was a fire in the kitchen, and the person couldn’t find the fire extinguisher? Would I not want them to come and tell me, “Oh my gosh, there’s a fire! I don’t know what to do?” Or would I say, “Well, you don’t have a solution, so let’s let the whole place burn down. I think that that’s a really problematic thing for leaders to say. 31:25 Michael Port: Yeah, I think that’s really insightful, I do. That’s really, really interesting. And sometimes part of our job is to help the people that we work with, if we’re in a management role, is to solve those problems that occur. But if we wait to interact with them, until it’s all solved, well then they’re doing it in a vacuum, and they don’t get the support that they might need and want, from you. And then, of course, you don’t have any input, because you weren’t involved in that process, you just waited to the end to be spoon fed the solution. 32:09 Mike Ganino: And it’s antithetical to a ‘yes, and’ approach, because, if we’re saying bring a brick, and it’s your job to bring ideas, my job to bring ideas and then we put them together and we see what we can do, then we totally ruin that if you say, “Don’t bring me stuff, just come with solutions,” then you eliminate the ability to be collaborative. 32:25 Michael Port: Interesting. Can we talk about performance reviews? Because it’s something you address in the book. You know, making an experience that is structured but also effective for everyone involved, because I’m personally interested in this. Because we’ve been growing so quickly, the team is getting bigger and bigger and bigger, and five years ago, if I had four people that were full time, I didn’t have to have a once a year review kind of thing. I also don’t do just once a year reviews, I think that would be insufficient, and then there’s all this pressure around that one review, and everything’s got to go perfectly and you’ve got to have all these, “Here’s what I want you to do to improve,” and all this. So, this is something that we’re working on, and I would love your perspective on it, to share with all of our listeners, because it’s such an important part of the development of relationships, and, I think, even if you don’t have your own business, with lots of employees, there are always people that you’re working with, and I think we need to have a review process, a performance review process with everybody that we work with. I mean, Amy and I sit down with our children, individually, and have performance reviews. Because it’s a part of the development process, as opposed to just when there’s an issue, “Oh, you really should try to behave this way!” It doesn’t necessarily create a structured learning environment. So, with that said, what’s your perspective on performance reviews? How should we do them? How should we make them effective and interesting and not so scary for the employee? 33:56 Mike Ganino: I mean, the poor performance review, the last couple of years, this sucker has been, we’ve seen people get rid of them, we’ve seen people change them, we’ve seen people paying attention to that. And what’s interesting is, there’s such an amount of – you know, whenever I talk to organisations about spending some money and investing in changing the way that people communicate, and using the ideas from improvisational theatre and the other places that I’ve worked, to kind of bring new ideas in – what I think is funny, is that there’s so many going back to default thinking. There’s default thinking that we don’t challenge. We spend billions of dollars in labour hours, doing these reviews that are largely seen as ineffective. I’ve rarely run into someone who’s ever said, “You know what? Things really shifted for me because I had a powerful performance review.” That’s just not something people say. And yet, we’re spending billions of dollars in people’s time and energy and systems to do this. I mean, when I work with some organisations and I ask them, how many hours do you spend doing this process, they don’t know. And so, when we sit down and actually do the work, they’re shocked by the amount of hours that HR goes into planning it. The amount of hours that the planners to into teaching it. The amount of hours that managers spend thinking about it. Then the amount of hours managers actually spend writing them, and then doing them, and then the employees, stressing out about them for three weeks. And you don’t perform well when you’re stressed out! I man, we teach that from the stage perspective. When you get up there to give a speech, if you’re super stressed out because you don’t know what you’re going to do, and you’re uncomfortable, you don’t know what’s happening next, you can’t really connect. And that’s happening to people. They know their review is at the end of the month, and the entire time they’re stressed out. That’s not effective, and it’s costing lots and lots of ideas. So, you know I always joke that I can make anything about improv, I can link the ‘yes, and’ idea to almost anything. And in the chapter of the book, on this, which I called, ‘Reviewing The Performance Review’, there’s this undercurrent that the review should be about saying ‘yes, and’. It should be about creating a common language. If you were reviewing me, we could create a common language of where we’re at today. What’s the real situation? The problem is that, in so many organisations, the real situation is just the manager’s opinion. We need more voices here. We need to hear. The same way when we’re working with a grad student on a speech. We’re listening, and you and Amy and I are coaching them, or they’re working with a voice coach, or writing coach, but we also need to see what does the audience that they’re going to speak to respond? How do they do it? How are they getting notes there? And so, we have to ‘yes, and’ the performance review process by saying, first of all, “How can I get the most relevant information?” and then, instead of telling you punitively, “Here’s what you did wrong and really should change,” I need to listen to what’s working, and how do we leverage that to get you where you and I need you to go for this organisation? Because that should be the goal of the review. 37:30 Michael Port: Yeah. It reminds me of the Plus Delta exercise. You know, change? Delta is the Greek symbol for change, so we’re looking for change, we’re not looking for what’s right. Because we’re often surprised by what’s effective. We don’t always know what is going to be right, but we might know something needs to change and what direction we want to go. And we can’t force anybody to change the way we want them to, but we can hopefully show them what’s possible for them, and if the conversation is focussed on transformation and change, rather than what one did right or didn’t do right, it tends to be a different conversation, would you agree? 38:37 Michael Port: So, I want to switch gears, just a little bit. So, for those who are speakers – they do workshops or breakouts or keynotes, or they’re consultants, they don’t see themselves necessarily as professional speakers but they are consultants who go in and work with organisations. They might be working with the board, or facilitating a meeting or training on some other topic. There’s two areas that I want to hit: One, I want to talk about how to do better training to improve culture, because you have a whole chapter, chapter 11, in fact, is on this. Understanding how training impacts culture, uncovering why training is so hard to get right, and much more. And I also want to talk about how, as a speaker going in and working with organisations, can you assess the culture of that organisation before you go in? And how can you fit in to that culture while also helping improve it, just through your presence there and the work that you do, and the transformation that you bring to that organisation? No matter what kind of topic it is. They’re going to say, “Well, we’ve got 175,000 employees, just FYI, and you guys actually don’t even work here, you’re just here for two days, so we’re really not even interested in that.” So, what’s the best way to approach it so that they know, “Oh, wow, they understand our culture, and they’re going to add to it.”? 40:12 Mike Ganino: Yeah, so on the understanding the culture piece, I’m sort of sketching the – I swore when I was done with this book, I was like, “I’m done! I’m never doing another one!” But, of course, the next day, you start getting ideas. We tell these stories culturally, and so, the best way to start to understand what’s going on in a culture, and I love this question, because, even if you’re coming in and you’re there to help with the sales team, you’re helping the sales team, or you’re coming in and you’re helping with executive coaching, or you’re helping with even a branding project, you have to understand the culture, to be effective, as a consultant or a coach or a speaker or a trainer. And even if you’re not a culture person, it would be really wise to sort it out, so my recommendation is, try to talk to several of the people you’d be working with, and maybe even some of the ones you wouldn’t. I always do this as a speaker, when I’m going to go give a keynote or a workshop somewhere, I always say that they have to connect to me with three to five people, who are going to be in the audience, so I can learn from them and see, what do they say. And so, what I would say as a consultant coach, speaker, workshop leader, go ask questions that are story questions. And so, stories have a couple of triggers. You’ll know you’re in story mode when there’s a specific time. So you’ll hear words like, “Well, three years ago…” Ooh! That’s a story cue! There’s probably a story coming up! When you hear people’s names, when you hear dialogue. So you’re like, “Well, then Lisa said…” then you’re in story land, what can you learn there? When you start to hear about specific things happening, because stories are about things happening. And so, my recommendation would be, rethink your discover process, so that it’s based on uncovering stories. I always look at Glassdoor. If you’re doing this, Glassdoor’s the greatest insight. Go look and see what are the employees saying about the place? If you’re going to to in and do sales training, what are the sales people saying about the company? Are they saying they don’t invest in them? Do they say they invest in useless training? You can learn a lot by listening to the stories. So that’s my number one advice there, is go into story mode, and then the other question around…Now I forgot the other question, I was so excited about the stories. 42:33 Michael Port: Well, we’ll get to that other one in a second, but let’s spend a little bit more time, let’s go a little deeper on understanding culture of an organisation that we’re going in to work with. So, Glassdoor you mentioned is so helpful. It’s a website, for those who aren’t familiar with it, where employees can talk about their experiences working for the companies that they work for and make some companies pretty nervous, because they’re pulling the curtain back, and it makes other companies very excited, because they know it’s a great place to work, and the majority of people love working there, and so people will talk about how special the place is. There’s a company that we work with, and I will not mention the name of this company, but one of the things that they told us was that their culture of training, isn’t, in their particular perspective, up to par with respect to the products and services that they sell. So, what we started to uncover was a general attitude towards training and consultants was not particularly positive, and so, we’re going in there as consultants and trainers, and so, for us, it actually gives us an opportunity, because we’re really darn good at what we do, so it gives us an opportunity to show the difference. But we also knew that the assumption that many of them would have going in, was that the quality wouldn’t be that high. And so, this is something that we had to prepare for, so I’d love you to speak to this particular issue, so that you understand what your role is when you go in there, and how to position yourself as the expert, or consultant, or trainer who’s coming in, who’s going to have helpful solutions for them. Does that make sense? Is there a question in there for you? I’m not entirely sure if I posed one. And you can start to work with those cues. So if you hear that, “Well, they bring these people in and they ran into…” I heard this last week, “Oh, yeah, we thought you were going to be another one of those people that they met at a conference and they thought, ‘Oh, come in and fix our employees,’ and so we were really surprised when you weren’t that thing.” Because it’s like they think their leader or their HR person went to a conference and now has “initiativitis”, they’ve got the hot topic. And so, I think, by paying attention to those stories and then addressing them, the same way that we would help someone with a speech, if we were working with someone at HPS, who was going to go share ideas that the audience was maybe resistant to, we wouldn’t tell them to ignore the fact that everyone in the audience is resistant to the issue. So, uncover the stories ahead of time so you can go in and address them. 47:01 Michael Port: Beautiful! I love that, because when we go in, and when I say ‘we’, I mean you, and Amy and me and the rest of the team, we ask everybody, “What matters to you?” It’s the first thing we ask people, because we spend a lot of time with the organisers, with the decision makers, who bring us in, on what matters to them, and what they think matters to the people in the room. But the people in the room don’t actually know that. They’re not part of that conversation, so they might not really know how much we care about what matters to them, unless we actually ask them, and give them the opportunity to tell us what matters to them. The other thing we do is, we also give them the opportunity to tell us about all the concerns they have, with respect with the fact that we’re there. Or they might say, “Yeah, I don’t know, they’re going to ask us to rub each other’s shoulders, and do silly training exercises and I really just want the facts,” or whatever. So everybody has got their own concerns, and if they can voice them, then they feel heard right from the get go. They know we’re not concerned, meaning, we’re concerned about their feelings and needs and experiences, but we are not defensive about our role in any way, shape or form, and we acknowledge that a lot of these concerns that they have, and issues that they’ve had are real, they’re legitimate, and it also lets us know that we shouldn’t do that silly game, where we have them rub their shoulders. It’s like, “Okay, take that one out!” I’m kidding, actually, because we don’t do that. 49:14 Mike Ganino: It’s a way to ‘yes, and’. 49:17 Michael Port: Yeah, exactly! It just makes it a little easier. So, with respect to training, this was my second part of the question before, how do we improve our training to improve our culture? Why is it so hard to get it right? What’s the truth behind good training? How do we understand how training impacts culture? How do we develop really simple frameworks that are actually appealing to improve training and how do we recognise when training needs an overhaul? So, I’m not asking you to answer all of those, just any of those would be really, I think, very helpful. 49:56 Mike Ganino: Okay, the two quick things, automatically: If you are someone who’s responsible for delivering training, or you’re delivering workshops, or you’re doing anything, remember that very few people ever learned anything by watching or reading alone, right? You have to take the ideas, because, if that was true, I mean, I’ve got some fitness books on my shelf, and I would be very, very fit and buff, if all it took was reading and watching. Everyone in America would be able to cook amazing meals, because we watch more food shows than so many other things. So that’s not the thing. You’ve got to give them activities, and that’s one of the reasons I love using improv. It’s one of the things we do when we do the master class and coaching on stage, is we get people to experience the thing. And so, if you’re responsible for designing any training, I’m not saying everybody should do role plays, but you need to think about the activities you’re asking people to learn, and then you need to give them a chance to get performative. You need to give them a chance to use it, get some feedback. Because, what’s going to happen is, if you give them the greatest idea, if you’re a sales trainer and you give them a great idea for a call, and the first time they have to use it is with a live, high stakes thing, guess what they’re not going to do? They’re not going to use your idea. They need to practice this stuff in a way that’s… And I see so many trainings be based on talking, talking, talking and lots of note taking. What we need to do is get people into their body, experiencing the change, so they say, “That wasn’t so scary. I think when the real situation comes up I can use it.” So, that’s number one. And then the other thing of how, any training, if you’re going in and doing training on any topic, you can be part of culture transformation. It is not just the culture folks out there, like me, who can help change culture. I don’t think culture is about a specific style of performance review, I don’t think culture is about ping-pong tables or snacks or stock options. All of those things are great wallpaper, but they’re not the core of culture. The core of culture comes down to relationships and communication. And, if you’re going into an organisation, imagine if you went in and you were there to teach some kind of specific customer experience project, or sales training, or HR focus, and they also said that, in addition to solving the problem, you made them a better team? Now you’re indispensable. So, focus on, in your trainings, focus on, in your consulting, the relationships between people and seeing if you can’t elevate that. Can you bring a little bit of ‘yes, and’ into the room, so that they can start working together different than they did before? You will become indispensable to that client, because not only did you solve their problem they asked you to solve, but you made them work together in a different way, which is irreplaceable. 52:23 Michael Port: Beautiful. 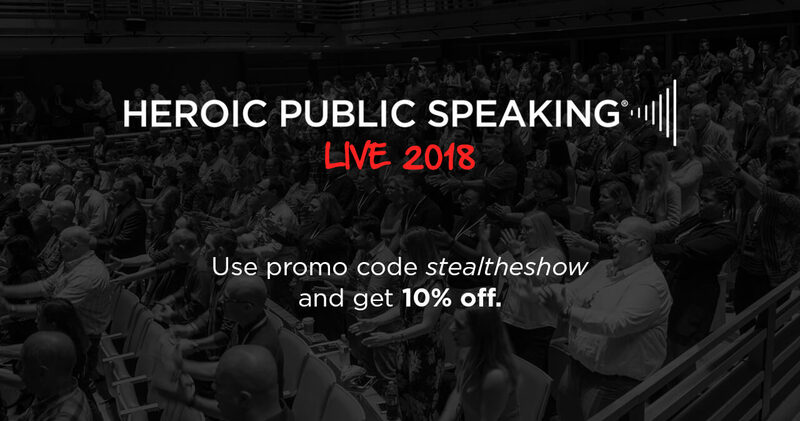 Well, of course, you can find Mike Ganino at Heroic Public Speaking Head Quarters, because he is our head performance coach, and you’ll find him all over the world, delivering trainings and keynotes for some of the biggest brands in the world. Where else can they find you? 52:38 Mike Ganino: I’m easy to find, I’m the Mike Ganino you’re going to find if you Google me. So, if you just Google ‘Mike Ganino’ you can pick your favourite place, whether it’s Instagram, Facebook, mikeganino.com, I’ve got all kinds of places to meet you and I’d love to talk more. 52:51 Michael Port: One of the things I love about your personal brand is that it’s so unGanino, meaning when I think of Mike Ganino, I see a different brand. How do I describe it? Like, I look more Italian than you do! And you are Italian and I’m not, at all. Anyhow, I just want people to meet you, because you just are just such a lovely person! Just such an incredible soul and a brilliant, brilliant teacher. And you make people feel capable, and I think that’s incredibly important, because I think sometimes we hold ourselves back, because we don’t feel capable of doing the thing that we want to do, and we need people in our lives who make us feel as capable as we are. And, without those folks, sometimes it’s lonely, you feel very lonely, and one of the things that Mike does, we hear it over and over from our students, and from our corporate clients, is that they felt more capable after being with him, than they did beforehand, and that’s pretty successful! I mean, if you can make people feel more capable than they were before they met you, well then, you added value to that room. So, Mike, I love you, thank you so much for taking the time to do this, and please reach out to Mike if you have any questions, but that’s our show for today. 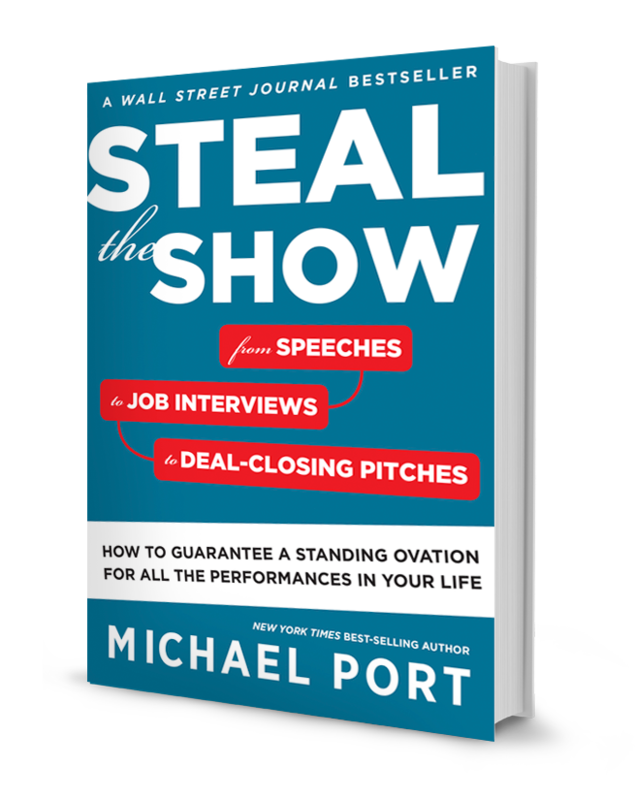 54:25 Michael Port: Thank you for listening to Steal The Show with Michael Port. I’m your host, Michael Port. Special thanks to our guest, the hair-raising and magnificent Mike Ganino, and to you, for listening and learning how to be a performer in your spotlight moments. I love you very much, not in a weird way, but I love you for being the big thinker that you are, and standing in the service of others as you stand in the service of your destiny. Bye for now.